The VeloVault is a versatile and secure travel companion for your bike, whatever your bike may be. It's well-designed and strong enough to cope with the rigours of international travel. Bikebox Online, who have designed the VeloVault, offer it either for sale or for hire, if you don't need a box that often. You can pick one up from one of their 14 hubs across the UK, or have it delivered. At £449 it's comfortably mid-table in terms of pricing for a hard case, but it offers very good performance. The VeloVault is fully manufactured and assembled in the UK. It's a two-piece hard plastic shell with a full-length piano hinge at the base, and it rolls on four sturdy castors, two fixed and two floating. Inside there's room for pretty much anything; Bikebox Online say a large 29er mountain bike will fit and certainly we had plenty of room once a large road bike was tucked up inside. The wheel mouldings have space for disc rotors, so you won't need to take those off when you travel. 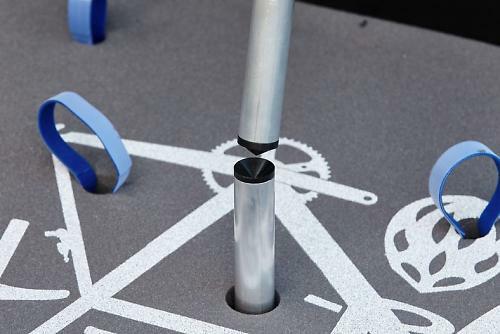 Wheels can be held with velcro but there's also the option to use a skewer through the case. That's a better option but the case doesn't come with skewers so you'll need to buy some; using your own quick releases isn't recommended as it's possible for them to get bent. The frame and components sit on a decent layer of foam padding and are held in place with velcro straps. You'll need to remove your seatpost, handlebars and pedals, and taking off your rear mech is advisable too, but there's plenty of room for everything. Once everything's in you can close the case, making sure that the two halves of the aluminium central strut engage. This strut prevents the box from being crushed which could damage your bike. 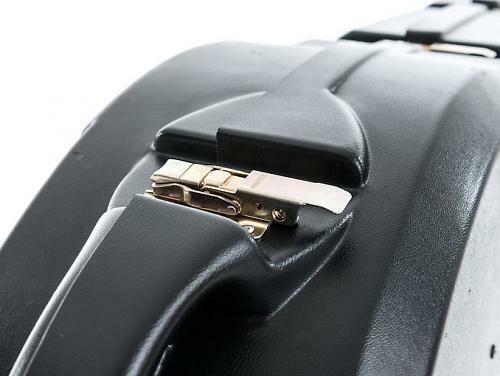 The clasps and the hinge on the VeloVault are top-quality. They feel sturdy and keep the box tightly shut, and there's holes drilled for a padlock so you can lock up your pride and joy in transit. Wheeling the box about once it's loaded is fairly easy. The wheels are goos but the handle isn't the most comfortable; it'd be handy if the box came with a strap for pulling it along. With a road bike and minimal kit inside the VeloVault sneaks under 20kg; most airlines will let you have up to 30kg for your bike, and there's plenty of room inside for kit. We've been very impressed with the performance of the VeloVault overall. One of our testers was sufficiently taken with the box that he's bought it and continues to use it. 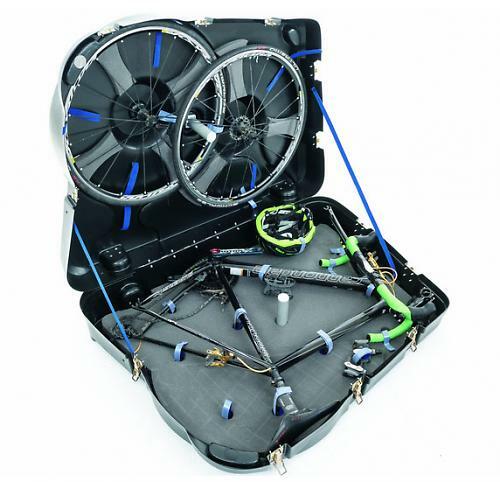 It's a good quality box that's well worth the money if you plane to do a lot of travelling with your bike. The Velovault is our own in house designed box. Utilising 5 years of bikebox rental experience and Sam Gardner's experience of competing as an international triathlete for 10 years, we gained a pretty good idea of which boxes on the market were up to the job and how we thought we could improve on existing designs in various ways. We are very proud to say that our box is British made and we mean proper British made! The Plastic shells are produced near Birmingham, as are the Protex™ catches and the piano Hinge, the webbing and foam are made either side of the Peak district, even the weight saving aluminium washers are made in England. Assembly is also carried out in the UK. Universal wheel fixings and larger wheel moulding – Velovault is fitted for all conventional wheel sizes, including the new 650b and 29er mountain bike wheels. No need to fully deflate your 29er tyres just to fit in the bike box. December 2014Interlocking Large Diameter central support struts – Designed specifically for the purpose. One strut has a pointed 'Male' end which locates into an opposing 'Female' cone on the other strut providing great crush resistance so an adult can stand on the centre of the box. Best of all, as the struts are integrated into the box, they'll always be in place even if customs open up your box. Extra length – Our box is 50mm longer than our competitors which accommodates the longer wheel bases now found on modern 29ers and downhill bikes. To keep our overall dimensions (Length + Height + Width) the same as our competitors we have lost a few mm of width and height. 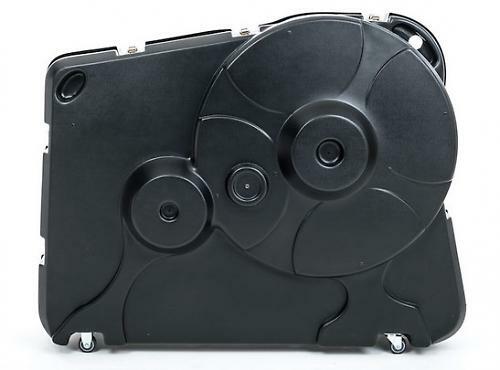 Quality fixings – A Bikebox is only as strong as its weakest point. Why spend £400+ on a box to protect your £10,000 bike and accept cheap Chinese catches which don't even have a Strength rating, or a box using cheap Piano hinge. We only use UK made Protex™ Catchbolts with a strength rating of 400kg per catch. If they're good enough for Formula 1 teams they're good enough for us. Sturdy, room for any kind of bike. Lack of supplied skewers, handle is a bit small. A very good box for the money. I have one of these and I'm happy with it. I can make comparisons against the BikeBoxAlan that I've used a few times previously (and was also happy with in fairness). What I didn't like about the BBA was that the catches seem a bit flimsy, the wheels were rubbish (although that may be because it was well used), and there was no flexibility possible for wheel size (the 'circles' for the BBA just fit a 700c wheel with the tyres deflated. Also the turning wheels for the BBA were at the short end, so it seemed to pull better from the short end, whereas the handle and height were better at the tall end. The velovault reverses this and is better for it. Also the VV's velcro straps when opened seem to hold just well enough to the foam that you can open everything out and it stays put until you want to fold them round. I can get my 53cm frame in with rear mech attached and seatpost still in place with no problem and still cms to spare, so just pedals and handlebars need to come off. Clearly a frame that fits Dave's 189cm height needs more manipulation. I can also get a trackpump, helmet and kit in. It's hard to break 30kg, but the 23kg common to lowcost airlines is very possible, so then pedals and shoes go a carry-on bag. I'd like to see better moulded handles on this and all other case, including one near the bottom for when you're lifting it into a car etc.